Al Hartmann | The Salt Lake Tribune Janell Lewis holds her baby Evie at a press conference at the Utah Public Health Laboratory Wednesday Jan. 31. Evie was was tested for spinal muscular atrophy because the Lewis' first daughter Blakely died from the genetic mutation. Evie received treatment for the condition early on. The Utah Department of Health announced they're going to start testing every infant born in the state for spinal muscular atrophy. The neurodegenerative disease is the leading genetic cause of death for infants, affecting one in 11,000. Al Hartmann | The Salt Lake Tribune Janell and Elliot Lewis play with their baby Evie at a press conference at the Utah Public Health Laboratory Wednesday Jan. 31. Evie was was tested for spinal muscular atrophy because the Lewis' first daughter Blakely died from the genetic mutation. Evie received treatment for the condition early on. The Utah Department of Health announced they're going to start testing every infant born in the state for spinal muscular atrophy. The neurodegenerative disease is the leading genetic cause of death for infants, affecting one in 11,000. Al Hartmann | The Salt Lake Tribune Laboratory technician Erinn Hardin puts punched blood samples into sample wells for further analysis at the Utah Public Health Laboratory The Utah Department of Health announced they're going to start testing every infant born in the state for spinal muscular atrophy. The neurodegenerative disease is the leading genetic cause of death for infants, affecting one in 11,000. Al Hartmann | The Salt Lake Tribune Laboratory technicians Julie Walker, left, and Michelle Quitugua organize the day's babys blood samples for testing at the Utah Public Health Laboratory. Andy Rohrwasser, right, directs the newborn screening lab. The Utah Department of Health announced they're going to start testing every infant born in the state for spinal muscular atrophy. The neurodegenerative disease is the leading genetic cause of death for infants, affecting one in 11,000. Al Hartmann | The Salt Lake Tribune Blood samples like this from every baby born in Utah are tested at the Utah Public Health Laboratory. The Utah Department of Health announced they're going to start testing every infant born in the state for spinal muscular atrophy. The neurodegenerative disease is the leading genetic cause of death for infants, affecting one in 11,000. Al Hartmann | The Salt Lake Tribune Janell and Elliot Lewis play with their baby Evie at a press conference at the Utah Public Health Laboratory Wednesday Jan. 31. Evie was was tested for spinal muscular atrophy because the Lewis' first daughter Blakely died from the genetic mutation. Evie received treatment for the condition early on. The Utah Department of Health announced they're going to start testing every infant born in the state for spinal muscular atrophy. The neurodegenerative disease is the leading genetic cause of death for infants, affecting one in 11,000. 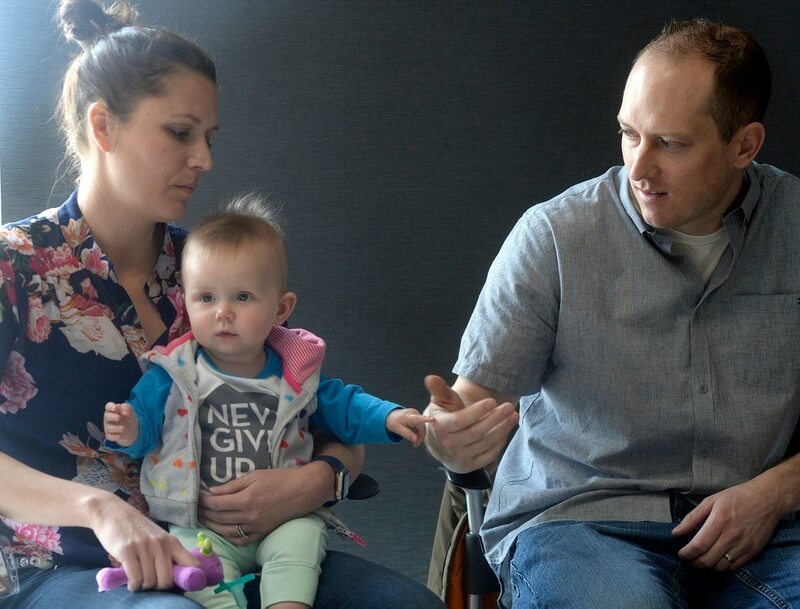 That breakthrough has prompted the Utah Department of Health this week to start testing all newborns in the state for SMA, adding it to 40 other genetic disorders for which Utah babies are now routinely screened. 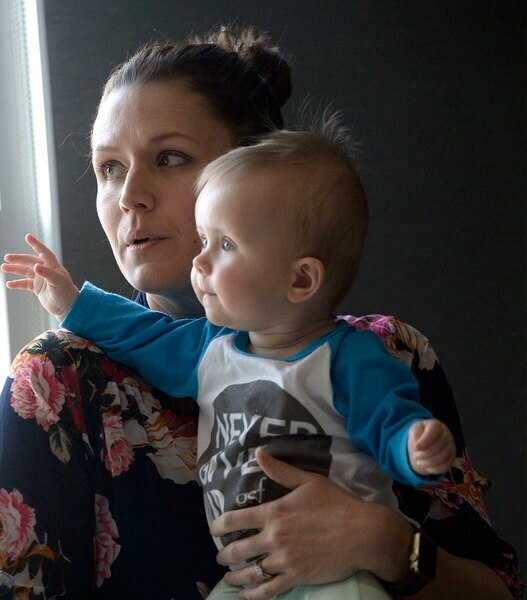 The new test — conducted using a blood draw shortly after birth — could save the five or six Utah infants born with the disease each year, health officials said Wednesday at the Unified Public Health Laboratory in Taylorsville. So far, Massachusetts is the only other state testing for SMA, which affects one in 11,000 infants nationwide. “There may not be any sign a newborn is sick until there is irreparable harm,” Kim Hart, a manager with the Utah Department of Health’s Newborn Screening Program, said of the disease. After losing Blakeley, the Lewis family wanted to try to have another child. Knowing the infant would be at risk of SMA, the couple opted for early testing, before their daughter Evie was born last April. “Unfortunately,” Elliot said, they “got the confirmation that she also had the disease.” But this time, they were prepared — and a new drug treating the condition was on the market. Evie began receiving Spinraza, which also goes by the generic name Nusinersen, 12 days into her life, in an effort to fend off any loss of motor function, such as walking, eating and breathing. Made by drugmaker Biogen at a cost of $125,000 per dose, the treatment must be delivered via a spinal tap as many as four times in the first two months of life, then once every four months after that, said Russell Butterfield, a University of Utah neurologist and SMA expert. Insurance companies, including the Lewis’, are covering the drug. “You can see the outcome is just drastically different,” Butterfield said. At Wednesday’s event, Evie happily sat with her parents, acting just like any healthy baby might: waving around her arms and staring at several cameras clicking nearby. Even with the treatments for SMA, there remain some “lingering effects” from the disease, Butterfield said, but only a medical expert would spot them. U. scientists had helped conduct trials on the new drug before it was released. And it was U. officials who signaled to the state that an SMA screening for Utah’s 50,000 newborns each year would be worthwhile, now that there was a way to treat it, Butterfield said, who added that less invasive SMA treatments are also under development. Health providers draw blood samples from Utah newborns from their heel. 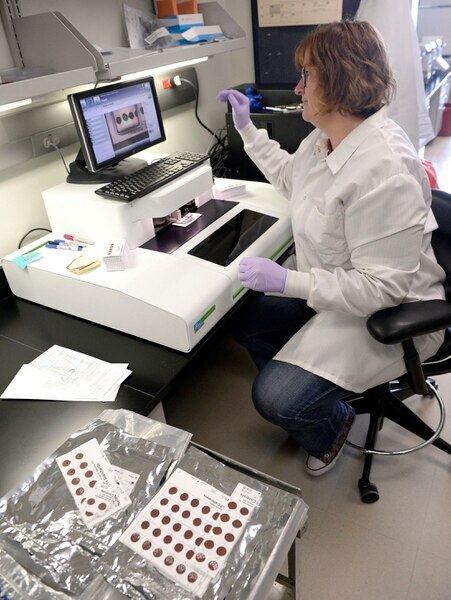 Portions of those samples, accompanied by the child’s demographic information, go to the Newborn Screening Lab in Taylorsville, where they are processed and tested by a team of about 20 technicians and scientists within days of the birth. The lab also recently deployed new handling machinery to help process the SMA tests more efficiently, laboratory director Andy Rohrwasser explained during a tour of the facility.